PHP 7.3.0 is new default version. V1.4 released, PHP 7.2.0 is new default version. UTF8 / Unicode support for filenames and directories implemented. The Windows Webserver was developed for testing PHP and CGI/FCGI programs under Windows, without installing an Apache or IIS environment. The Webserver is easy to install and comes with buildin PHP 7.3.2 FastCGI support, mod_rewrite and SSL/TLS 1.2. Also FTP(S) and WebDAV is integrated. WWebserver is not Apache and was developed from the scratch. It was tested with common OpenSource applications like Wordpress, Joomla, Drupal, Typo3, Magento, phpMyAdmin, PIWIK, AWstats. It's like XAMPP - but much more smarter. Or use only command line, the smallest version without buildin PHP. You have to download your preffered PHP version manually and configurate with FastCGI support. 2. Type in your Host, Port, Document Path and start it. The default HTTP Port is 80, but you can choose any other Port if there is just running another Webserver on your system. If you dont need SSL you can mark checkbox No HTTPS. After starting you can close the window and control the Webserver with the Taskbar Icon. You can define virtual directories to handle multiple document paths. Note: After changing vdir.txt please STOP and START Webserver again. You can define own CGI Programs for example Perl or Ruby. 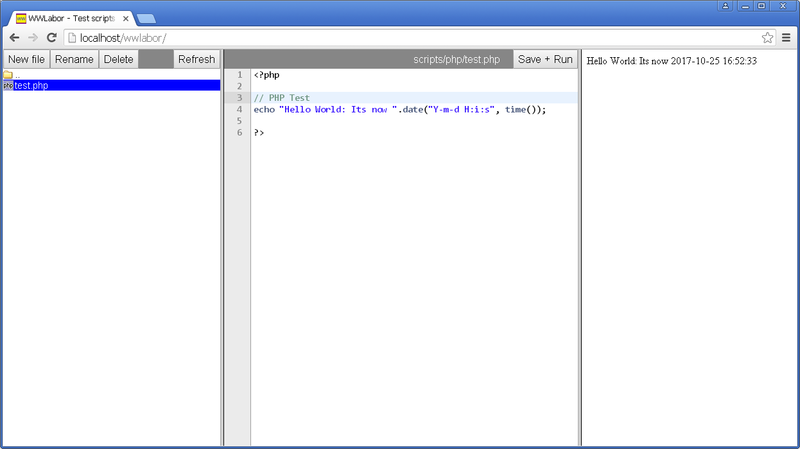 In this example we associate file extensions .rb with Ruby scripts and .pl with Perl scripts. .php .php3 .php4 files are associated with PHP FastCGI support. Note: After changing cgi.txt please STOP and START Webserver again. 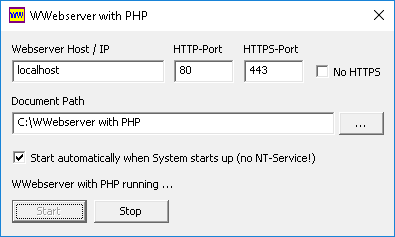 Note: After changing php.ini you have to EXIT and RESTART the Webserver. Read more about mod_rewrite, Redirect and .htaccess. 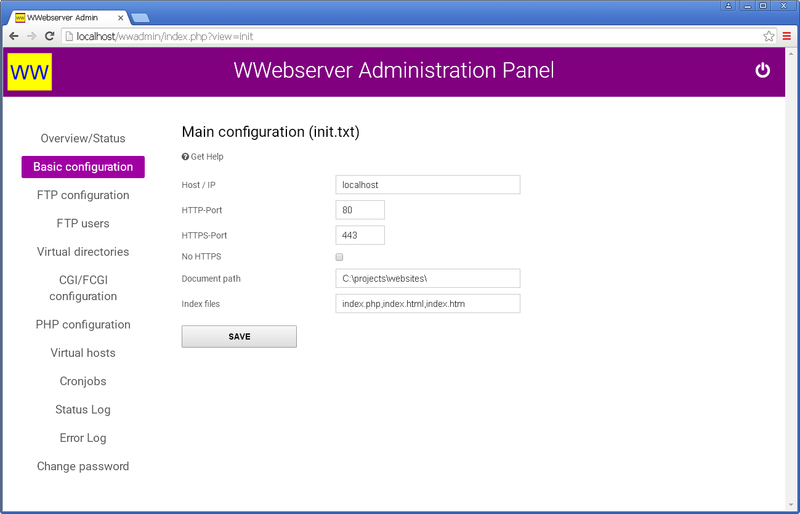 WWebserver understand the HTTP Basic Authorization. Read more about directory protection. Note: Old Webbrowsers does not support TLS 1.2. You need modern Browser for HTTPS connections. Self signed certificates are marked as insecure by most Webbrowsers. The path /webdav-users/... will always prompt a user login and link to the home directory of the specified user. Note! You dont have to enable FTP to get WebDAV access with wwadmin user or FTP users. Note: You dont need to restart Webserver after changing crontab.txt. Bug reporting and discussion: Take a look at the Windows Webserver Forum. Old versions (also for Windows 2000) you can find here.